Someflu recently increased even further the use of polymer resins for handling corrosive and aggressive medias by providing a new solution to critical applications. In collaboration with Aplast, Someflu’s unit of research, development and innovation in high performance plastic molding, Someflu has just developed a first centrifugal pump made of thick parts using one of the most technical advanced resin on the market: The PEEK. 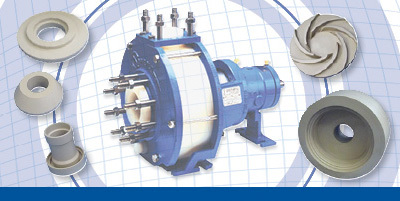 In the past already, for the implementation of the ATEX Directive, Someflu was one of the first pump manufacturer to use antistatic conductive polymer resins to conform all of its product line while maintaining thick parts construction for all its pumps. 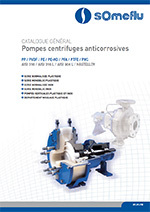 At that time, Someflu already offered pumps made of PFA-EL, PVDF-EL, PP-EL, PE-EL. Subsequently, Someflu has developed many pumps for specific customers applications through the use of polymer resins such as PSU, ECTFE, or PVDF with carbon fiber reinforcement (CFRP). These characteristics allow it to be one of the best-known engineering plastics and one of the most used in the technical industries. The prototype developed by Someflu is a pump of the NP series, size 80-50-200, a chemical process pump according to the ISO 2858 norm. All the parts of the pump in contact with the fluid are made of thick resin in PEEK: volute casing, impeller with an over molded insert, cover, shaft sleeve, and cartridge. Specially developed for critical applications, it can be equipped with single or double mechanical seal (Type Someflu, Cartex or other).